As I write this it is still rhubarb season here in Michigan and our refrigerator is filled with these tangy, bright spears of deliciousness. I have frozen some to enjoy later in the year when we get hungry for a bite of summertime but I still haven't gotten my fill this season. I have made rhubarb crumble, rhubarb berry coffee cake, rhubarb and mixed berry cobbler, rhubarb muffins and a rhubarb crisp. I walk around all day thinking of different things I can make with my abundance of rhubarb. Perhaps a bread, or a pie would be good, maybe an upside down cake. How about something savory rather that sweet? My friend Cam of Culinary Adventures with Camilla, roasted up some rhubarb and made scones. Maybe I should roast some and toss it into a salad. Or maybe make a chutney to serve with grilled meats. The possibilities just run through my brain. 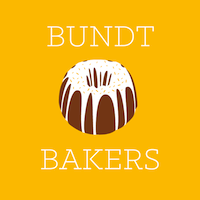 Then, as luck would have it, our Bundt Baker's theme this month, chosen by Shilpi of Simply Veggies, is fruit and nuts. A perfect way to use some more rhubarb. 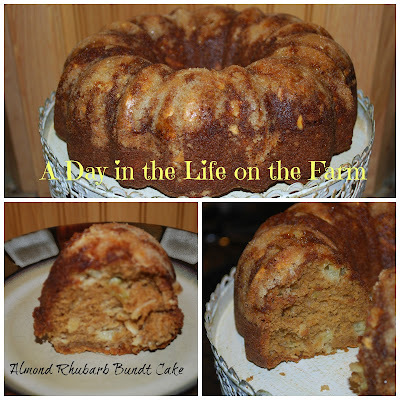 I adapted this recipe from an almond rhubarb coffee cake that I found on Allrecipes.com. It turned out beautifully. A perfect start to the day or a wonderful finish to your dinner. I think this will be staying on my rhubarb recipe rotation for many years to come. Preheat oven to 350* and prepare a bundt pan by spraying with baking spray. Combine melted butter, 1/4 c. almonds and granulated sugar. Sprinkle this mixture in the bottom of the bundt pan. In large bowl of stand mixer fitted with paddle attachment, beat together brown sugars, oil, egg and vanilla until smooth. Reduce mixing speed to low and add dry ingredients, alternately with the milk until combined completely. Add the almonds and rhubarb and stir to incorporate. This was definitely a keeper Andrea. I love rhubarb. It's hard to get in my part of the world, but this looks delicious! Isn't that the way feast or famine, depending on where you live. Lovely bundt cake, great combo of almond with rhubarb. I wish it was more available here or not stupid expensive in stores considering how crazy it grows. Enjoy all that you have. And I just made another rhubarb recipe that will be posting on Monday Olivia. mmm, it´s seems so delicious, it´s a pity not to have rhubarb here! It does look good. And I am not even a fan of rhubarb! I think i have finally made a fan out of Frank Paula. This sounds amazing! Great recipe! Beautiful Bundt... I am sure, it will be delicious as it looks.. It was Shilpi, thanks again for hosting. I haven't ever baked with rhubarb. I do love it. So I will be baking with it soon. I hope you enjoy it Anshi. Rhubarb is a favourite of mine and almond is a great choice to go with it. Looks wonderful. Rhubarb is also a favourite of mine, looks really delicious Wendy!! Sounds like I should give rhubarb a try! I absolutely love rhubarb. I grew up in the midwest where rhubarb was abundant. Unfortunately, it is quite difficult to find in California. I love all things rhubarb and your bundt turned out fabulous! I didn't realize rhubarb was a midwest thing. Interesting that we have something you don't other than mosquitoes LOL. No rhubarb here in the deep south, but if there was I would definitely make this cake. I bet it was delicious!!! It really was. I think you would love it. This sounds absolutely delicious! What a great combination! It was. I was very pleased. Rhubarb is one of those vegetables I hear people talk about every summer but I never see in supermarkets near me. I'll have to find out if they just never have rhubarb down here or if it's just my specific stores. I never realized that rhubarb was a midwestern thing Kelly until I wrote this post. Here it is like zucchini, you have so much you don't know what to do with it all. Gonna try this one this year! I hope you enjoy it Julie.